The adequacy of Dion’s product-transfer procedures and training. The adequacy of the Federal Highway Administration’s oversight of motor carriers’ procedures and training for loading and unloading hazardous materials. 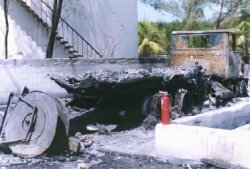 The adequacy of Florida’s oversight of the fire safety of storage tanks.The Safety Board determines that the probable cause of the accident was Dion’s lack of adequate procedures and driver training, resulting in the driver’s pouring a mixture of gasoline and diesel fuel from a plastic bucket into a cargo-tank compartment that contained a mixture of explosive vapors.